Forty-eighth Regiment, N. Y. Vols. March Through Virginia—Attack upon the Rear Guard—Crossing the Chickahominy—Inhabitants Asking Protection—Capture of Rebels—Crossing the James—Cowardly Officers. On the evening of the 13th inst. 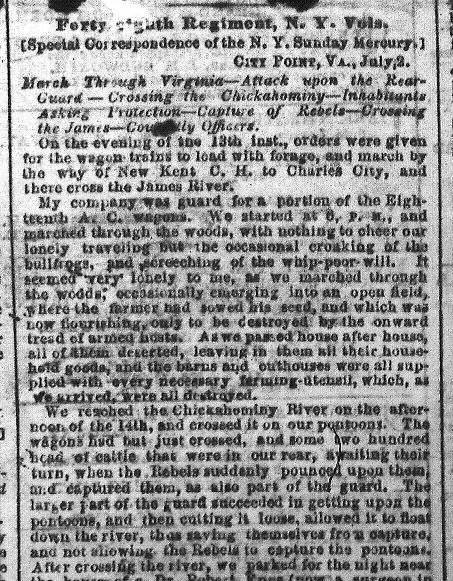 [June 13th, 1864], orders were given for the wagon trains to load with forage, and march by the way of New Kent C. H. to Charles City, and there cross the James River. My company was guard for a portion of the Eighteenth A[rmy]. C[orps]. wagons. We started at 6 P. M., and marched through the woods, with nothing to cheer our lonely traveling but the occasional croaking of the bullfrogs, and screeching of the whip-poor-will. It seemed “very” lonely to me, as we marched through the woods, occasionally emerging into an open field, where the farmer had sowed his seed, and which was now flourishing, only to be destroyed by the onward tread of armed hosts. As we passed house after house, all of them deserted, leaving in them all their household goods, and the barns and outhouses were all supplied with every necessary farming utensil, which, as we arrived, were all destroyed. We reached the Chickahominy River on the afternoon of the 14th [of June 1864], and crossed it on our pontoons. The wagons had but just crossed, and some two hundred head of cattle that were in our rear, awaiting their turn, when the Rebels suddenly pounced upon them, and captured them, as also part of the guard. The larger part of the guard succeeded in getting upon the pontoons, and then cutting it loose, allowed it to float down the river, thus saving themselves from capture, and not allowing the Rebels to capture the pontoons. After crossing the river, we parked for the night near the house of a Dr. Robert Epps (now a surgeon in the Rebel service). This house was the only brick one we met with on our route. In going through it, I found a great many medical works and various documents belonging to the Doctor; among the rest was a paper, requiring his payment of taxes and tithes. Dr. Epps was the proprietor of 840 acres of farming land, which was assessed at twenty cents per acre, and he was required to send to the Commissary store at Richmond one-tenth of the products of his land. Close by this house lived Captain Cook and wife (formerly of the United States Navy). When we arrived here, we were asked to furnish him a guard to protect his grounds and houses, which were well stored. I asked him how it was that he had not been taken into the Rebel Army. His answer was, “When I resigned my position in the Navy at the outbreak of this Rebellion, it was with the understanding that I was to remain neutral.” These are the kind of men whose property we guard as we go along. Men who received a munificent education at the hands of our Government, only to desert her in time of need. Such men should be treated the same as all deserters are dealt with. They should not be allowed to keep what they have stored away, from our men; for I know that it is all shipped to Richmond as soon as an opportunity offers. Going still farther, we came upon several large plantations that had splendid orchards to them. Apples, cherries, and peaches were here in abundance, and the boys helped themselves to everything. The country through which our route lay is a very undulating one, the roads winding through the woods and over open fields, up hill and down gulleys, with the dust flying in all directions; but there is one thing in Virginia which makes up for this, it is, that water can be obtained at almost every step. On the afternoon of the 16th [of June 1864], our advance guard, consisting of one regiment of cavalry, one of infantry, and two batteries, captured some 240 prisoners. Of these, 44 took the oath of allegiance, and were allowed to depart; and, I will venture to say, that in less than twenty-four hours after their release they were again in the Rebel Army. On the morning of the 17th [of June 1864], we crossed the pontoon on the James River, below City Point, and continued our march toward Petersburg; heavy firing was constantly heard in our front.1 We arrived within four miles of Petersburg, when we were ordered to cross the pontoon and join General Butler’s column at the Point of Rocks. We arrived there at 8 o’clock, A. M., of the morning of the 18th [of June 1864], having accomplished a distance of sixty-four miles in less than five days. We were visited the other day by the President, who was enthusiastically received by the men. On the 19th [of June 1864], an officer was drummed out of the service, with the word “coward” on his breast and back. This is what should have been done long ago. There is no other cause to which can be laid the reason of men running, excepting that they follow their officers.